Bluegrass Pundit: DARPA wants industry to build a flying drone "mothership"
DARPA wants industry to build a flying drone "mothership"
Washington (AFP) - It's a Hollywood sci-fi fantasy that has long eluded the Pentagon: a flying "mothership" that launches smaller aircraft. The Pentagon's research agency put out a request to industry this month to outline how a large cargo plane could release drones to spy on or attack an enemy and then return to the flying aircraft carrier. The concept conjures up fantastical images from "The Avengers" film and the "StarCraft" video game, with large, lumbering motherships sending out smaller craft -- but there are no cloaking devices involved in this particular project. At the moment, the Defense Advanced Research Projects Agency (DARPA) is not close to constructing any test planes and is merely exploring the possibility on paper, officials and experts said. "This is the float-the-idea stage of the concept. It's not the build-me-a-prototype stage. We're not to that yet," said author Peter Singer, who has written extensively about robots and warfare. 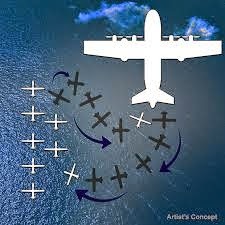 In a conceptual drawing from DARPA, a cargo plane resembling a C-130 releases a squadron of drones that look similar to Predator or Reaper aircraft.